THE MDC is proposing a number of changes at its forthcoming elective congress to be held in Gweru next month, to ensure that power is distributed equitably within the party. 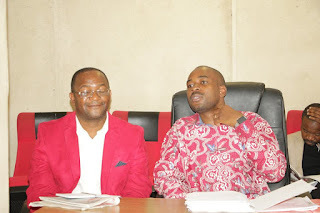 Party secretary-general Douglas Mwonzora yesterday said the congress must usher in a new, dynamic and robust leadership that is willing to serve its members well and with respect. The congress is the first for the party since the death of its founding father, Morgan Tsvangirai, who succumbed to colon cancer early last year. "For us to truly reflect a democratic outfit, it is imperative that the 5th congress does not centralise a lot of power in the president," Mwonzora said, adding that the party must also go beyond tribal and gender lines to accommodate all progressive-minded people. "We are also cognisant of the need to afford women and youth opportunities to assume leadership positions. "In order to cover for the disparities in gender and ethnic representation that might arise through the democratic electoral process, it might be necessary for us to reserve certain positions for the disadvantaged groups of our society. "It is also key that all the regions are represented at national leadership," Mwonzora said. This comes as the MDC is conducting its nominations process ahead of the congress, with Chamisa increasingly appearing as the favourite to become Tsvangirai's substantive successor. "As the secretary-general, I strongly believe in a united, democratic, tolerant, and — above all — a disciplined party. "To this end, there must be robust, nonviolent contestation in which people must shake hands afterwards and allow the party to move forward with renewed impetus. "Therefore, we look forward to a credible electoral process leading to congress. The on-going congress electoral process must not be reduced into a charade of candidate imposition as this will render the whole intention of rejuvenating the MDC useless. "The will of the people at grassroots must be respected," Mwonzora said. He further said that the congress must also enable the party to reflect on its weaknesses and strengths and set the tone for the 2023 elections. "A recent development where some elements within the party have resorted to mudslinging and tarnishing others so as to discredit their candidature is regrettable. "The on-going violence and intimidation of members … is a serious affront to the very tenets and democratic principles on which the MDC was founded. These are acts of cowardice by people afraid of contestation. "Our congress must not only be about elections, but must also be a festival of ideas. As a party, we have gone through very difficult and turbulent times in the past five years having lost our iconic leader ... Tsvangirai and suffered a stolen victory in 2018.